The ASBP is pleased to be a partner of Timber Expo and UK Construction Week 2018 which takes place from 9th-11th October 2018 at the NEC in Birmingham. ASBP will be exhibiting on stand no. T365 within the Timber Expo zone throughout the show. Come and visit us to catch up on our latest activities. We’ll also be running a competition with 3 winners receiving free tickets to our Healthy Buildings Conference and Expo which takes place on 28th February 2019 at London South Bank University. 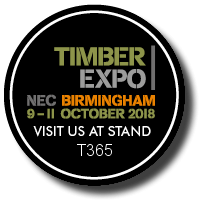 Timber Expo is an annual trade show in the UK, covering a breadth of timber applications from timber frame, sawmills, merchants, glulam, SIPs, CLT, fixings and fastenings, timber cladding, doors/windows, mouldings, skirtings and flooring. Trade visitors can gather under one roof to discover the latest products, innovations and developments across the timber sector – not just from the UK but from an increasingly exciting and diverse international market. Come and visit us at stand no. T365. Our member STEICO UK will also be exhibiting on stand no. T420. ASBP members can receive a 10% discount on exhibition stands. To make an enquiry, please contact Andrzej Manka at andrzej.manka@media-ten.com.